Below are all of the questions we could remember having been asked in the past. If you have a question that we still haven't answered, please feel free to email kickstarters@alivenetwork.com or call the guys and gals at Alive Network on 0845 094 3815. Do Kickstarters have any specific requirements? The ideal stage or performance area should be 6m by 3m but if space is tight - we can all just about fit into an area of 5m by 2m. Be sure to have planned our live performances around a schedule, as the best events have a great flow to them - so don't go serving the buffet when we're 20mins into the first set! To create an epic finale to your event, we recommend timing the final set to the last hour of the party. 2 live performance from 22:45 until 23:45 with encores or DJ music until midnight. We have a lot of experience choosing our set lists and running order as we know what works with what (through alot of trial and error...and skill of course), some tracks just don't work, especially if the key of the music clashes...However, we are more than happy to take requests before the event so we can find a way to work them into the set without unwanted tempo drops or clashes of sound. The best thing to do is let us know any songs you definitely DO or DON’T want rather than a list that we feel we have to stick to. See our repertoire page to see the full list of current songs we play. We are able for hire anywhere in the UK. Ocassionally we'll travel internationally. We are primarily a function and wedding band who only play private events, so there is a very slim chance of seeing us live in the public eye. However, if you are lucky enough to be invited to a party we're playing, then you can see us there! We are more than happy to learn a special song, but there are a couple of things to consider - if the song requires to be transposed into a different key that can take a bit longer to practice and secondly, we must have a few weeks notice to learn and rehearse new songs to the standard all our other tunes are at! We are exclusive to Alive Network Entertainment Agency so you can only book us via www.alivenetwork.com, this website, by emailing kickstarters@alivenetwork.com or by phoning our agents on 0845 094 3815. We bring a latop computer with a huge collection of party hits from all eras to put on before, between and after our live sets. We include the background 'laptop' music in the standard booking fee, however for just £120 more, we will man the decks to take requests and make announcements. We don't use wireless microphones in our live performances so making announcements from the table where you are sitting is off limits - that being said, you can by all means use our mics on stage to make announcements when we are not performing, just ask us before using our gear and we'll happily oblige. Yes, we'll provide very high quality lights that light up both the stage and the front of the dance floor. 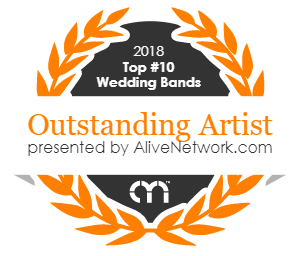 Our standard service includes 2 hours of music, so whether you want the typical 2 x 60 minutes or 3 x 40 mintue sets, it's up to you and what will suit your event the best. You can discuss this by speaking to our agent. We arrive at your venue at 18:00 and typically start performing at 20:00. The music finishes at midnight unless you have upgraded to include late (after midnight) finish. It takes us an hour and a half to unload our van, set up and sound check (if there are no access problems to the venue). No sorry - we only take on guaranteed contracted work because it's unfair to turn down other clients who definitley want us at their event and can't because someone might want to book us. We are committed to our passion and livelihood so there is a very slim chance the band will split up. However if for whatever reason we do, Alive Network and the band will make every effort to find a replacement band. We'd rather not have a disaster on our hands if we have an unexpected singer appearing on stage with us. However, if you've prearranged to sing with us and/or have singing experience we'll welcome you to centre stage with open arms. Just please bear in mind you booked a professional band not a karaoke service! We dress to suit the particular event type or however you'd like us to dress. Usually we'll dress formally where we can and smart casual when told casual. Prices start at £812 for gigs in London and vary county to county going up to £3275 for international events. Make an enquiry at AliveNetwork.com or by using the form on the right hand side of this site to get an instant quote for your area. Yes. Check them out here. Nothing special, just a secure room to change in, a meal and refreshments. We have played in loads of different venues up and down the country, small and large. We welcome any kind of stage, whether it's a festival stage or football pitch, barn or hotel function room. Expect us to be as loud as you'd imagine a gig to be when on the dance floor then gradually getting to a level where you can converse comfortably about 10m from the stage. If your venue has a sound limiter it is important that we know this before the event so we can prepare to restrict our decibel (dB) output. We usually request 2 double 13 amp sockets located close to the stage/performance area. We prefer to run our lights and audio through separate power outlets to reduce the risk of noise interference. We have only ever experienced power issues in events in marquees where the generator capacity has been too low.